William Fredrick Durst is an American musician and movie director from Jacksonville, Florida, born in the year 1970, august 20th. This wonderful musician was a tattoo artist himself and then reached heights of success as vocalist of the Limp Bizkit and Multi-platinum nu metal rap band. Fred Durst has released several successive albums and topper in this list is his awesome “Significant Offer”. Durst has also excelled in his career a director with his movies, “The Longshots” and Education of Charlie Banks”. 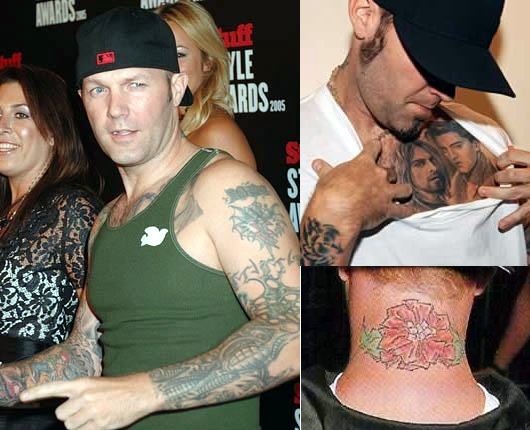 Fred Durst has adorned his well toned body with unique tattoo collections as a tribute to those special people in his life. Every tattoo in his body holds rich memories and has deep meaning. There are portrait tattoos, flower tattoo, painting tattoo, and more that needs a lifetime to explore through his body, because his body is almost covered with exquisite body art designs. Following is the list of awesome tattoo collections of Fred. He has a back tattoo of an angle design and a huge flower tattoo decorating the back areas of his neck. There is a spiral design tattoo etched on his left leg. Fred has inked two black color shaded X letters tattoo on his right hand middle finger. There is a portrait of enchanting everlasting beauty Mona Lisa’s painting tattoo on his right upper arm. And Fred has also tattooed the portraits of Elvis Presley and Kurt Cobain on the left side chest exclusively. There is a pleasant picture tattoo on his right shoulder that has a fresh scenic image of a mountain and sun rising up. There is a barb wire tattoo flaunts around his right bicep. Another astounding tattoo is the huge portrait of Albert Einstein inked on his right calf.